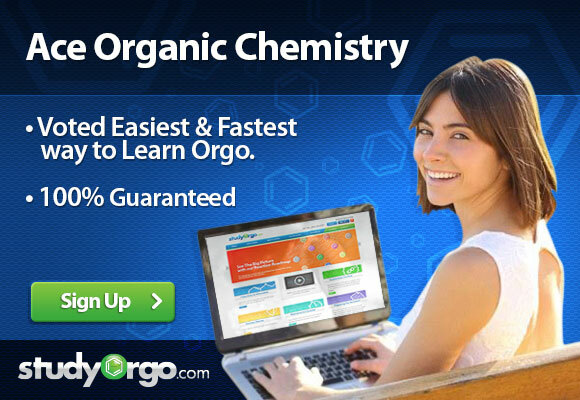 There may be no subject of study more feared than organic chemistry. Many students quickly find their mastery of the materials inadequate to answer the most basic questions on their practice exams. However with effort, time and a sensible strategy you can definitely become ready for the next exam! Here we present 5 tips to grasp organic chemistry concepts and reactions quickly and efficiently. Most students of organic chemistry begin studying for an exam, very often 2 to 3 chapters of material, a week before the exam. It may have worked for History 101, but it won’t work for this course! There is no short cut, so don’t spend your time looking for one! Think about it – your class is likely 2 hours per day and 3 days per week; that is 6 hours of lecture each week. Your rule of thumb should be 1 hour of studying for each hour of lecture. Take that time to go back to the PowerPoint or class notes and ask yourself, “Do I really know what’s going on here?” The sooner you begin, the more time you have to answer questions and really prepare yourself for the exam. Set up a calendar to help yourself budget your time and maximize your efficiency; Monday – study lecture notes on Chapter 1, Wednesday – practice problems on Chapter 1, Friday – office hours with professor on Chapter 1 questions. By using good time management, you get maximum results in the minimum time! Tip #2. Go back to the beginning. As students review the material, there is a compulsion to skip of the beginning of the lecture and early chapters of material because it’s “background” or “really easy” and jump into the material they don’t understand. This is a recipe for self-defeat! Organic chemistry is like a pyramid – the top will collapse without a strong base. Even if you think you have no time, go back to the introduction and early chapters and spend some time reviewing this material. You will likely be surprised how much better you will grasp the “hard” material once you completely understand the “easy” material! Tip #3. Gather all practice questions and old exams. Another shortcut to avoid is jumping right to the practice exam as your method of study. These questions are likely as hard as they will possibly be for your course and require a complete understanding of the concepts and mechanisms involved to answer them. As a T.A. for over 8 years, I estimate 70-80% of exams are based on practice questions assigned by professors from the book. So why not master those practice problems? If you master how to solve these questions and nothing else, you have already passed the exam! During your 6 hours of studying per week, take half of the time to solve the practice problems assigned. Write down any questions you have about each practice problem and try to find the answer in the book or seek help from professors, tutors or websites like StudyOrgo. Once you solve these questions, use the practice exam as a “check” for any remaining issues and you will be completely prepared to ace your exam! Tip #4. Assemble you knowledge. As you review material and practice problems, write down any questions you have, no matter how slight. After you complete the review, come back to these questions at your next study session and look for the answer. If you can’t find the solution on your own, set up a meeting with your professor, tutor or check StudyOrgo for help on the material. For studying mechanisms, try making a table reactions or flash cards of the reactions. Just by preparing these materials you are mentally studying the reaction and are preparing for the test, and you have your own study aid that you can understand to refer to right before the exam. Tip #5. Get a good night’s rest before the exam. Recalling memory is almost impossible if you are fatigued. Pulling an ‘all nighter’ for organic chemistry exams almost never ends well for students. Your best bet is to get 7-8 full hours of sleep before the exam, even if you feel you aren’t ready. Ask yourself – what can you really learn the day before the exam? Use the day before to refresh your memory on what you have learned in your studying sessions and practice problems. By following Step #3 & #4, you have this material very organized and written in your own hand so reviewing should be easy! And just in case your notes are unclear, the material presented at StudyOrgo.com is tailored to explaining mechanisms and concepts in a very clear and simple format to help you study. By following these 5 tips you will feel fresh, have a clear mind going in and have the best chance of getting an A on the exam. Good luck!